Ludemann Engineering is bringing American-style Formula 1000 auto racing to Thailand. 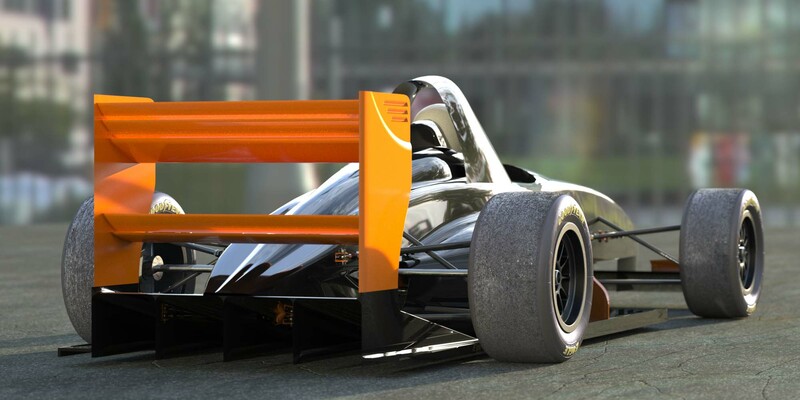 Formula 1000 is a new class of racing, using 1000 cc superbike engines, steel tube frames, and fiberglass bodies with full wings, ground effects, and racing slicks. 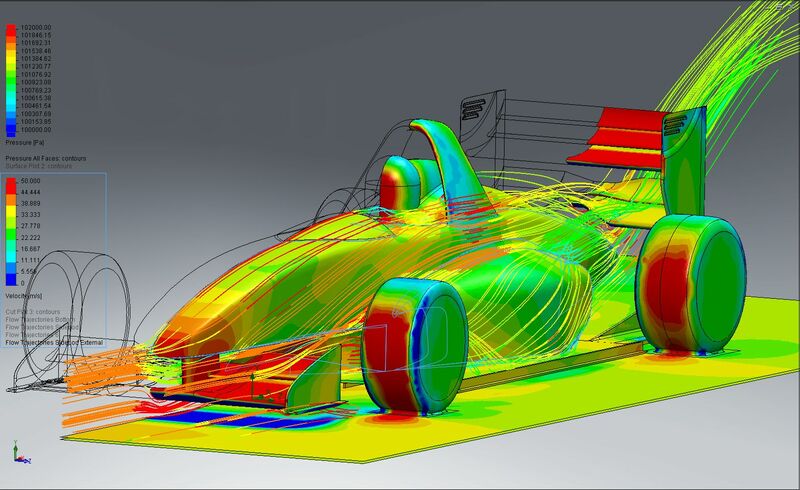 The car is being designed using the latest computer technology including computational fluid dynamics and finite element analysis at a level that was only available to Formula 1 teams a few years ago. James Ludemann designed his first race car in 1980-81. He went off track and pursued a career in computer design, where he became the chief designer of the fastest desktop computer in the world at the time, the Sun SPARCstation 1, outselling all the Star Wars movies combined and providing the platform on which the first full-length feature computer-animated movie, Toy Story, was rendered. He later founded and ran Antares Microsystems, a manufacturer of add-on board for Sun computers, and sold the company before the crush of Chinese imports destroyed the industry. He now lives in Thailand and devotes himself full time to the JL.12 project. Sample Computation Fluid Dynamics (CFD) analysis plot of surface pressures and flow trajectories. Way to go Jim !!!! Hiya Chris! Yes, it’s a long way from running a tech co in Silicon Valley. Much more fun! What color do you want to order? I’m also in Thailand (diving instructor for the winter season, 4th season here) and I’m also building a car back home (Haynes Roadster). Where in Thailand are you located, I’d love to visit you and see your work if it could be possible, the car looks amazing! Private email sent. Hope you can visit! Hmmmm, your email server thinks I am spam. Call me at 087-906-8181. It should be much easier to build an F-1000 car in Australia. Ebay Australia will be extremely useful. I’d like to hear what you’re planning. I’ll email you separately. I can confirm that building a F1000 car in Australia is very easy, and eBay is the happy hunting ground it promises to be. Doug- if you would like to contact me, I have enough parts to nearly build 4 cars, (but not enough time…), and you are welcome to take most of the parts you need for a small fee, and I will include all the research data I have gathered over the last 8yrs. And I have a jig if you require a chassis. That would be great, I certainly haven’t done anything as complex as your design, I have done a lot of work on sedans and some Open Wheeler support mechanicals, the primary thrust of my design was to be 90% recycled and affordable for the Hillclimb Community over here. I can’t upload photo’s from my Ipod as yet, I’m using Linux on my desktop, but I will email you some info and photo’s on what I have come up with when I get the chance. Nice car!!! Do you have any shirts, sweatshirts with your race cars on them with Ludemann engineering on them people can buy? Thanks. I currently plan on selling almost-complete cars, with out engine, brake calipers, wheels & tires and a few other off-the shelf components. I expect also to have a complete parts list available individually. I know some race car companies won’t sell replacement parts unless the purchaser has a chassis number, but I learned a long time ago you never want to argue with your customers. Please contact me at 607-786-0010. I emailed you, but haven’t heard back. I’ll try calling, too. Tried to contact you back in March and never heard back. I just read the May 5th post and if you did try to email me it may have gone to junk or I may have deleted it not recognizing your email. Would like to discuss where you are at present in regards to completing the car and get more info. Sorry we haven’t made contact yet. I was down in the shop, working hard. I’m back on the computer now, finalizing some design before sending out for CNC fab. As for where the project stands, we’re making actual body panels at this very moment. Molds are finished, and the first complete body will be finished this week. I found a machine shop not far from here with something like a dozen CNC milling machines sitting mostly idle, so I’m going to have them do a lot of parts for me. The fire has been lit, as I’ve been contacted by Thais who want to organize a racing series but need the car fully debugged less than a year from now. Hi there, what a great set of pictures of your foamed body buck racing car. Do you have any pictures of the subsequent stages please ? I’m scratch building a replica of a 60s Alfa racer, if you have time, please see my blog at the address below. Engine rebuild stages right now, but I’m planning ahead for the body! Hi Jim, Great work on the car so far. I am also planning on building one and I think I got my work cut out for me as I stay in South Africa!! I would really appreciate any input I can get as I am actually planning on opening a F1000 class in South Africa. Looking forward to hearing from you. Jim, Do you have / sell a ‘Kit’ that I can assemble. I’m in Colorado. Willing to travel to pick-up also. I’m planning on selling cars, although I haven’t decided yet on what stage of assembly they’ll be in. I expect it will include almost all the custom-made parts and a list of what standard parts to buy. Stay tuned. I know that you probably had people ask you for the PDF of the jig I read the date is there another way to get a download of that? Greatly appreciate it. Sorry for the late reply. I can’t find the PDF of the complete design, but I’ll email you the STEP file, which you should be able to read into any CAD package. Nice work there! I was trying to design a similar car as well. Would love to seek for your expertise & create new business opportunities in Malaysia. Will explain to you more through email. Long time, Nice job on the formula car, Daughter is working on mechanical engineering, will forward the solid works data for her education. Hey, Greg! Good to hear from you! Quite a change for me, huh? Thanks! It’s definitely not cheaper to design and build it yourself, and there’s no such thing as a kit so far. It’s something you do only if you’re obsessively compelled to do it, like I am. I can see that you’ve been doing a great job on this project. I can see that you are a big fan of Ayrton Senna as well as I am. So, I’m from Brasil and my brother and I enjoy building and modifying cars since our teenage. The point is: we need to build a car like F1000 to compete at a Mechanical Engineering Race in Rio de Janeiro. I’ve seen your project a few times and I’m very interested in it. Can you help us, specially with the chassis (mesurements, type of tubes…) ? It would be too much asking you this favour? Tubing has to be either drawn-over-mandrel (DOM) or seamless steel, mild or chrome-moly. Many tubes in the chassis are specified by the SCCA rules in both diameter and thickness. Formula 1000-specific rules are in 9.1.1.G, and formula car chassis rules are in 9.4.5 . Regarding suspension, what analysis have you done with respect to geometry and weight transfer? Might those be Fox mountain bike shocks? The springs/dampers are triple-adjustable pit bike units. If I can make them work it’s a big win, as the high-end ones are ridiculously expensive. Jim, any thoughts if your engine wiring harness? Would love to help out/ sponsor if at possible on such a great project. I do custom wiring conversions for motorcycle powered race cars here in the states. Sure, just post a comment to my website. I’ll be better in the future about responding. I am blown away by the sheer quality of the work. Good luck with the project. I was cleaning up my storage and found some Antares serial boards – I did that Solaris device driver many moons ago. I was looking around for Antares and looks like you moved on long ago. Yeah, in the back of the storage room with a lot of other stuff. Probably moot at this point returning them to you. Thailand? Seems like the shipping would be prohibitive. Fast cars?!? I recall that Porsche you had – I remember that ride we took where you blew off the high end ford. Sounds like all is going well. Hope Thailand is treating you well. Me, retired after doing my own consulting thing for 12 years. Trying to figure out how to be retired. Not obvious. Anyway, drop me a line if you get bored. As for how to be retired, I just follow my nose until I find something that I’m really interested in doing. Hi there, just watched through your videos of this build on YouTube – I’m also in Thailand and am currently building a car for the Nitto 3K race series……would love some advice if you have some free time to chat. How is this car coming along? Do you have plan on building the chassis for sale? Sorry I haven’t updated the site in a while. I like to post complete projects, and right now several projects are in progress but not complete. The diffuser is finished, the front wing is finished except for the endplates, and the rear wing hasn’t been started. Yes, I plan on selling the cars as kits at various levels of completeness, probably including a bare chassis. Will the chassis support 1300cc hayabusa engine? I plan of building some type of race car just for my two sons (18 & 22 yrs old) to fool around. Just something for them to start and learn. This type of car was their choice. Previously, they built a couple of shifter karts and time for them to up their knowledge and interest to formula type car. I am interested buying a bare chassis & assess from there what other parts needed to complete the project. Perhaps, source other parts here in the mainland. I know that your chassis were made in Thailand and I don’t think there’s a problem shipping it. Please quote me with the price and please use my email without posting the prices here. I am pensioner , my hobby to biuld up racing cars like yours & kit cars. I would like to give you my coplimant for yours nice project ,in this moment I work on Ariel Atom with subaru turbo engine & I preshiat a pipel like you .I will hope wi can be in tach in the futcher. I am sorry for my bad english.Thankful Eduard Shechter from Israel. Good day!, do you share or sell your full chassis Plans/renders? we would like to build one!